Last summer, State Fair time, Greta and I were asked to write a blog piece about mothers and daughters and hearing loss. After some thought we got something written and gave it to Starkey. We were told it would be released near Mothers Day. It was published last week. I am so proud of Greta for taking this on with me. I have attached our blog piece. In honor of Mother’s Day, we asked Starkey Halo wearer Sara Lundquist and her daughter Greta to talk about how their relationship has helped influence Sara’s hearing journey. Greta, who is passionate about hearing health and Starkey, is her mom’s advocate, and Sara is proud to see Greta take such a passionate interest in hearing health and the philanthropic initiatives of Starkey Hearing Foundation. This is a special Mother’s Day post celebrating how a unique mother-daughter bond helped one mother achieve better hearing. There is a special bond between a mother and daughter. Your daughter is like a mini version of you. You want to teach them and mold them in the ways of the world. One thing I want to instill in both of my children is empathy for others. I want them to understand that not everyone is the same, and that is ok.
My kids know I have a hearing loss. It is measured as a moderate severe loss. As a child, I had chronic ear infections and PE tubes which led to a mild hearing loss that has continued to worsen over the years. My kids know to face me and repeat what they said if needed. And a few years ago, my daughter got an inside look into my hearing loss and it changed her, for the better. A couple years ago I was given the Hearstrong award for being an advocate on being proactive about hearing loss and treating my hearing loss. 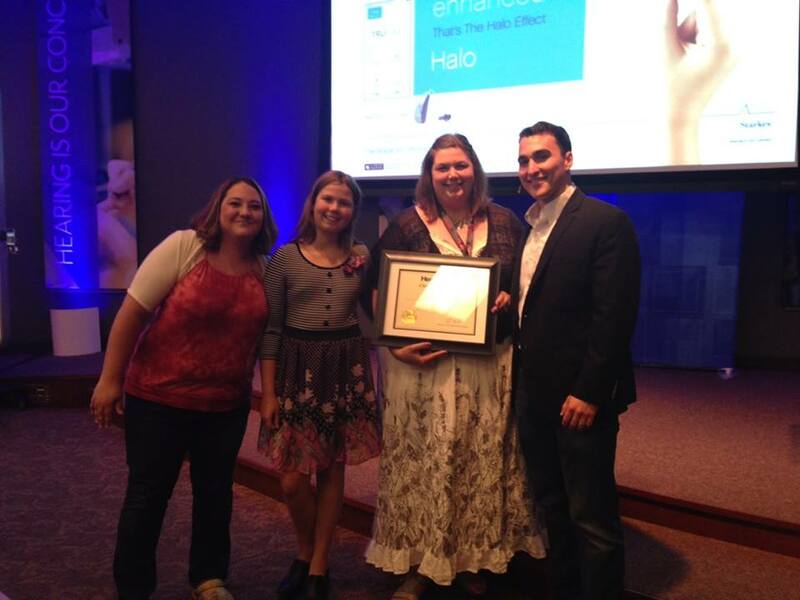 I was given the award at Starkey’s worldwide headquarters in Eden Prairie Minnesota. I had no idea what to expect on this day. My daughter and a friend accompanied me to the ceremony. What followed the ceremony is what lit a spark in my daughter’s eye and a flame in her heart. We were taken to the Center of Excellence where I was given a hearing test. I didn’t know any of this was going to happen. The wonderful part of going through the routine hearing test was having my daughter was with me. She was right there when I was told that new hearing aids would be given to me. There were tears of gratitude and also a very raw feeling of gratitude since I knew the hearing aids I had weren’t up to the job of accommodating my hearing loss. It had taken me a long time to talk about my hearing loss, and even today, I am still working on being open about it. It is not something to be ashamed of but to have people watching me and being the center of attention about this topic made me feel very vulnerable . Part of my intimate private life was on display. Every parent feels at some point or another that they need to hide the unhappiness of the world from their children, to hide the facts that not everything is perfect. But, that day my daughter not only saw that my hearing is far from perfect but she also saw what a wonderful giving heart Starkey possesses. She learned that we don’t shy away from these kinds of issues but tackle them head on and that it’s important to spread awareness of hearing loss and using hearing technology. Greta got to see how impressions are made. She was able to follow my impressions and see how two sets of earmolds are made for each person. She saw how impressions are molded and polished. She saw how hearing aids were picked for an individual and how they are fitted. She was with me when my new hearing aids were ready and turned on for the first time. She saw my facial expression, one of amazement that I could hear her and everything around me so well. She saw the positive change my new hearing aids created. And my Starkey experience didn’t stop there. I was able to try out SurfLink assistive listening technology. Sitting and watching a show with my kids and hoping the captions are correct is usually the norm but to hear the show directly streaming in my hearing aids was another thing altogether. Starkey opened my eyes that day. What they do there is amazing and it is now on my daughter’s top places to work when she is an adult. That day when I went to Starkey with my mom opened my eyes to new possibilities for my life and goals I set for when I grow older. While my mom was getting her hearing aids I got to do some amazing things. I got to see where they were made and how they were made. I was able to interview and talk with Tani Austin. She soon became one of my role models. I watched Operation Change and would love to help on a mission and be able to see people’s reactions like I saw on my mom’s face. I was able to talk to some of the employees and they gave me a couple impressions. On my way home I couldn’t stop talking about the experience. I had to do something with the passion I felt. I have decided to channel this passion into my 4H projects. This past summer I got a grand champion and was able to go to the Minnesota State Fair and present my project on hearing aids. I love to try and educate people on this subject. A blue ribbon and memories that will stay with me always. The pride in a mother’s heart can burst to the point of bringing forth tears of happiness. This has happened many times with my daughter. Seeing her step into that role of advocate and educator makes me so proud. My mother’s instinct tells me this girl could go places in her life. Thanks to Starkey for lighting that small flame which grows with time and age. HearStrong is the nonprofit that is held by the company EarQ. It honors individuals that have overcome hearing loss and decide to do something about it. The way they heard about me is they happened upon one of my blog posts on the SWC Blog. I was given a gold medal and a framed certificate from two great gentlemen from EarQ and from Tani Austin from the Starkey Hearing Foundation. I was accompanied by my good friend Allison and my daughter Greta. It was an honor I will take seriously and keep advocating all I can. 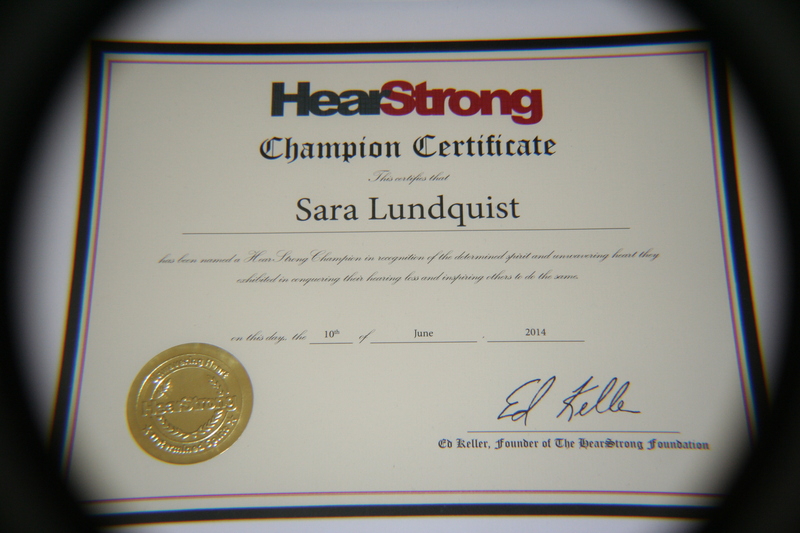 HearStrong asks you to take the challenge to be a Champion and bring attention to hearing loss and help make this stigma the that hearing loss affects all not just a certain generation. I do take this challenge and I hope to be kept accountable that I will continue to do so. After a wonderful ceremony and pictures we were handed over to Starkey. I had no idea what the rest of our time there would be but I was told it would be worth it. We were told to drive to another building (huge complex) and they would take care of us. Well what I didn’t know and was a surprise is I was given a hearing test and given a new set of hearing aids and lots of fun gadgets to go with them. I was in shock, in no way was I expecting anything at all. It started out with a video of the inside of my ears. The neat part of this whole process was that my daughter and friend were with me and asking question and taking pictures of all of it. Greta wants to do a project on hearing loss and hearing aids for the county fair this year. I think she got lots of first hand info on Tuesday. I was then given a hearing test by a Starkey Audiologist. We were then treated to lunch. Anything we wanted at no cost to us. Another high point for my daughter, you can tell she is 11. Impressions and molds were made next again pictures and my daughter and friend were right there. They got to watch the whole process and ask any questions they wanted. In fact my daughter got to come home with a few ear molds that were made. They are now prized possessions. Now the waiting game started. 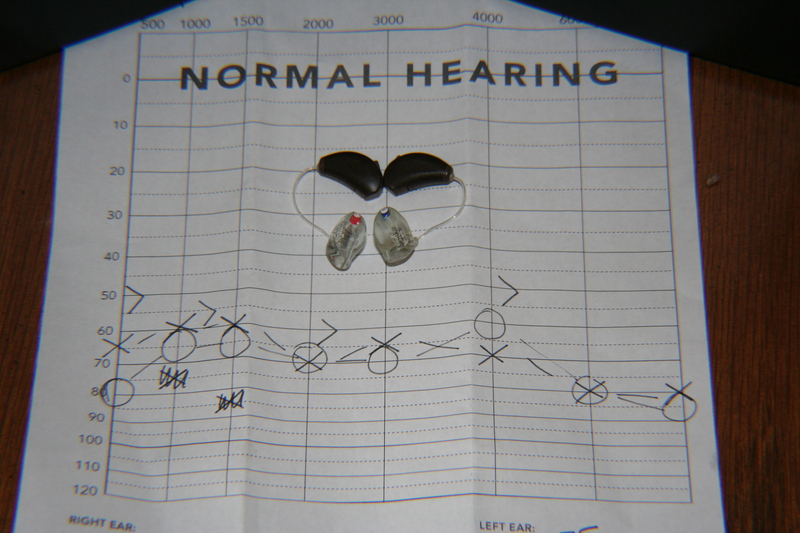 We waited a few hours while custom made hearing aids for me. I was given XENO RIC with a custom earmold around the receiver. Much more powerful than my last pair. During the waiting period my daughter was able to have a private meeting with Tani Austin about the hearing missions the Starkey Hearing Foundation have done all over the world. Greta is inspired and would love to go on a mission with them someday. Who knows anything is possible. Finally at 6pm my hearing aids were done. I was also given two additional items, one is the SurfLink Media which plugs into my TV and I can listen to the TV wirelessly directly into my hearing aids. Very cool item and having fun trying it out. I can even have the TV on mute and I can listen to it at a good level for me and not disrupt anyone else in the house. 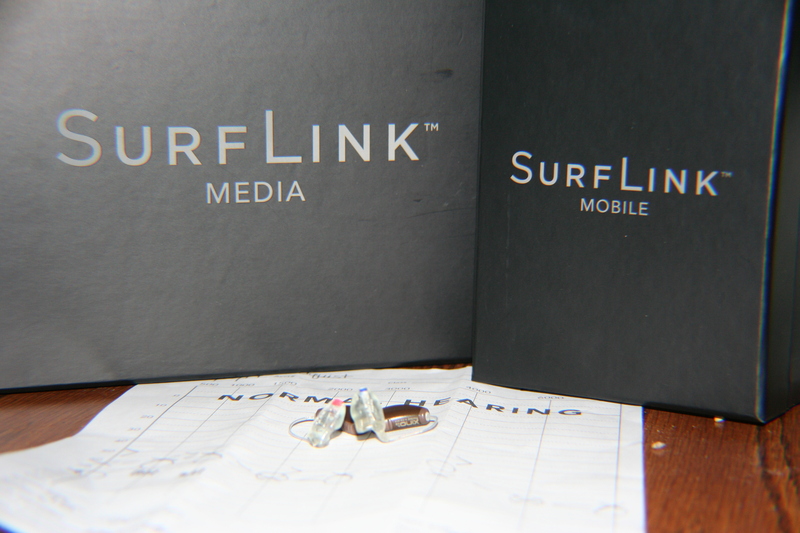 My other gadget is the SurfLink mobile. This is a remote I can use for my hearing aids I can change programs and change the volume. I can use it as a bluetooth for my phone so again the sound is wirelessly sent to the hearing aids and I don’t need to use the actual cell phone. The one feature that I think is the most fun is I can stream my iPod and listen to all my music through my hearing aids instead of taking them out and using earbuds and complaining the volume doesn’t go high enough. It was a day I will never forget. I am still waiting to wake up from an incredible dream. I thank my friend, Allison, for taking 14 1/2 hours away from her family to be there with me to experience this once in a lifetime day. I thank my daughter, Greta, for being so grown up and asking questions and being engaged. Her project for the fair should be blue ribbon all the way. Most of all thank you all for reading my writing and keeping me accountable.